Ben’s Insect Repellent is tested in some of the worst bug-infested areas in the world, for protection against deer ticks, mosquitoes and other disease-carrying insects. 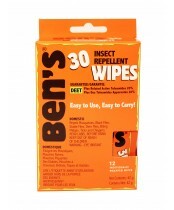 While many bug repellents are alcohol-based, Ben’s uses a water-based formula. This means less evaporation and less absorption of DEET into the pores of your skin.